I hope everyone who read Part 1 understands, I'm not criticizing Houdini or passing any sort of judgement on him. He was and always will be an iconic performer. I'm just giving some background as to where some of his material originated. Make no mistake, though he may not have created everything he did, it all had his unique stamp on it. A Houdini trick was a very specific sort of thing and he really knew how to find and develop those routines that fit him. In many cases he did create something original. Here are a few more for you to enjoy. Once again, I refer to Houdini-The Key, and Patrick Culliton's knowledge. In the book, he says the East Indian Needle trick originated with a magician named Ramo Sami in early 19th Century London. This information came from Houdini. Interestingly, Long Tack Sam, who was a friend of Houdini's was very well versed in the Needle Trick, having learned it in China. So, maybe the trick came from China and found it's way to Europe or vice versa. Houdini made a masterpiece out of the trick and because of this it became one of his signature routines. This goes back to what I was saying in Part 1. A good performer takes a routine and does it so well that it becomes associated with him. Houdini did add one other thing...according to Long Tack Sam, Houdini copyrighted his presentation which prevented anyone else in Vaudeville from performing it. I can't say I really blame him either. One piece of Houdini's act that I was surprised to find he did not invent was the Galvanized Milk Can Escape. This was actually the idea and creation of Montraville Wood. You can read all about the Milk Can and it's inventor by clicking here. I will say, that although Houdini did not invent the Milk Can Escape, in this instance he surely was the first to present it and that alone makes it a Houdini Original in my book. He created the iconic performance that other performers try to copy. But Houdini did it first and it was a huge hit for him for many years. Another Houdini original was the Straitjacket Escape. Houdini was the first to escape from a straitjacket. However, it was his brother Hardeen, who stumbled upon the idea of doing the escape in full view. 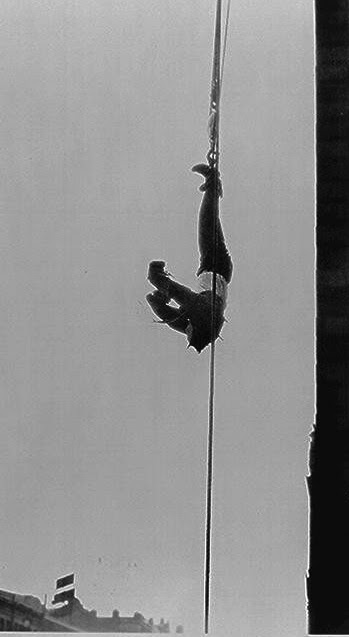 Houdini's original presentation had him being tied and secured in full view and then put into a curtained cabinet to escape. In the Hardeen version, he did the entire escape out in the open. Houdini quickly added that feature to his escape as well. And yet another bit that took the straitjacket from an indoor escape to an outdoor spectacle was the Hanging Upside Down Straitjacket escape. Oddly this too, was the idea of someone else and not Houdini. It was believed for a long time that a young man named Randini, shared the idea with Houdini. But WildaboutHoudini.com has presented an article about a man named Mysterio who did the hanging straitjacket escape even before Randini. I think it's safe to say however, that no one received the kind of press for the Upside Straitjacket Escape that Houdini did. Great post Dean! 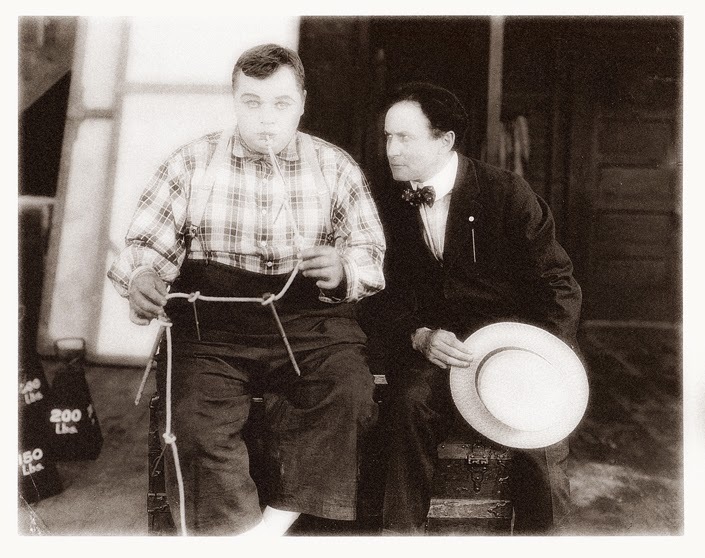 As you probably know, Houdini had fractured his left wrist prior to this photo with Arbuckle. I believe while filming The Grim Game. He's hiding the cast behind his straw hat.